There are children sprawled on the floor of wards, twisting and turning with discomfort upon their mattresses. Many are critically ill, being tended by their worried parents, but they can only wait. 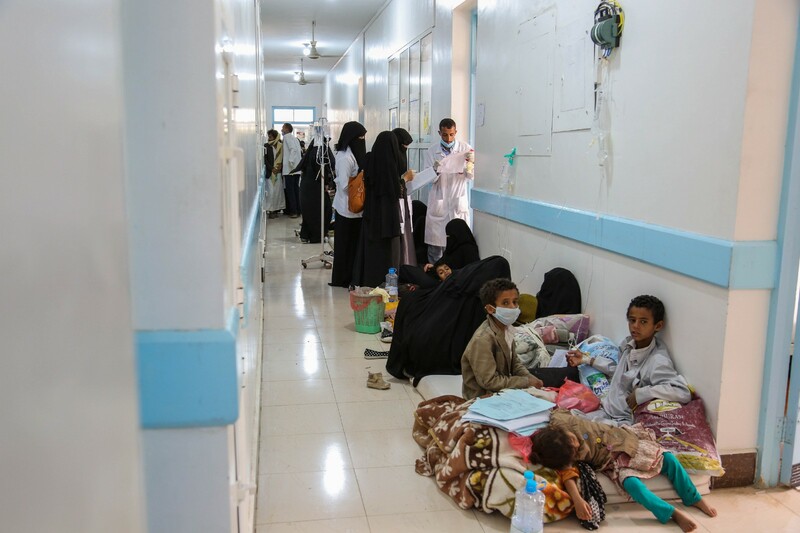 A devastating cholera outbreak across Yemen has left hospitals and treatment centres struggling to cope. Patients are pouring into hospitals from all corners of the country, and doctors and nursing staff are already stretched beyond their capacities. 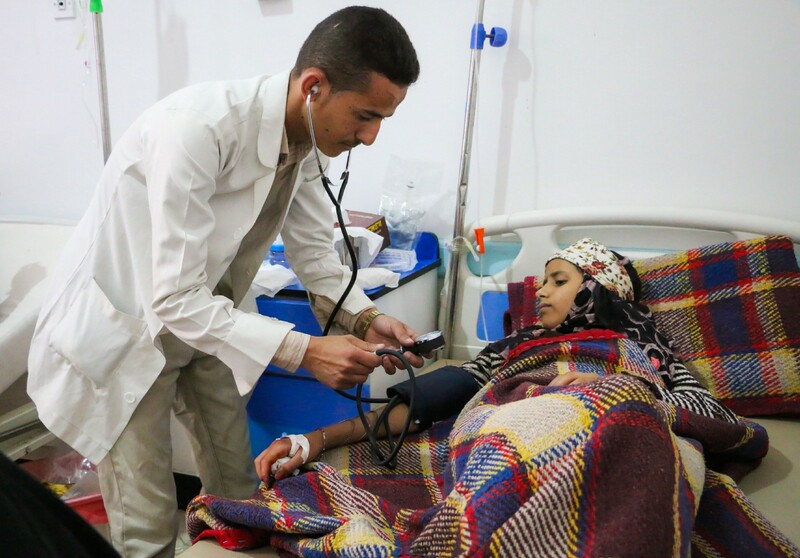 In Yemen, four children a day are now dying because of cholera. Geert Cappelaere, UNICEF’s Regional Director, was recently in Yemen to oversee the organisations operations. “At the triage in one of the few functioning hospitals I visited, I witnessed harrowing scenes of children who were barely alive — tiny babies weighing less than two kilos — fighting for their lives. I fear that some of them must have died overnight. 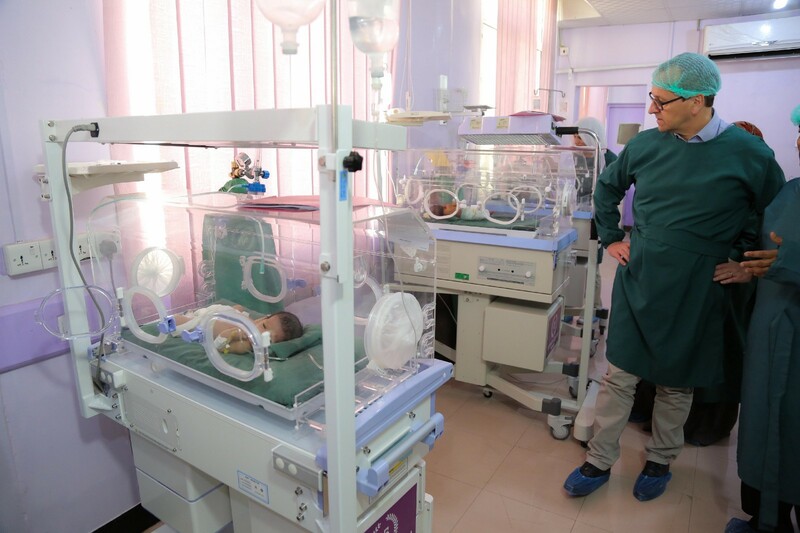 UNICEF Regional Director Geert Cappelaere checks on the condition of babies in incubators. It is a new and terrible cruelty for a country that is hurting horribly. Yemen was already suffering through one of the worst hunger crises the world had seen in decades. It was already a country wracked by civil war. Now, the scourge of cholera. Famine, pestilence, war, and death. The Four Horsemen have come to Yemen. 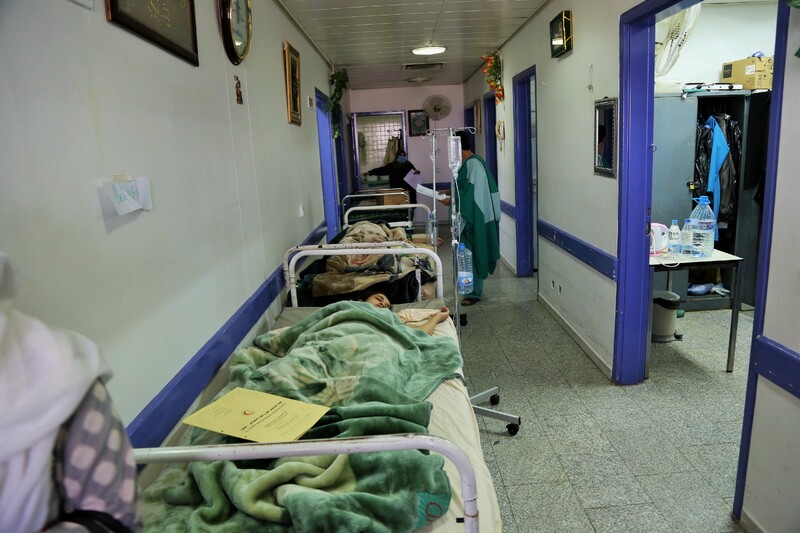 Hospitals throughout Yemen are so overcrowded that patients are spilling out into the corridors. Over just three days in late May, the number of suspected cholera cases in Yemen rose by 10,000. Over 1,000 children have been reporting to health facilities every day. In just over a month, cholera has claimed the lives of at least 790 people. Around half of those affected are children. The number of suspected cholera cases is expected to reach 130,000 within the next two weeks. And children suffering from malnutrition are more likely than most to fall victim. One-year-old Khawla was one of the lucky ones to make it to hospital. She was suffering from malnutrition, and battling a chest infection which was affecting her breathing. 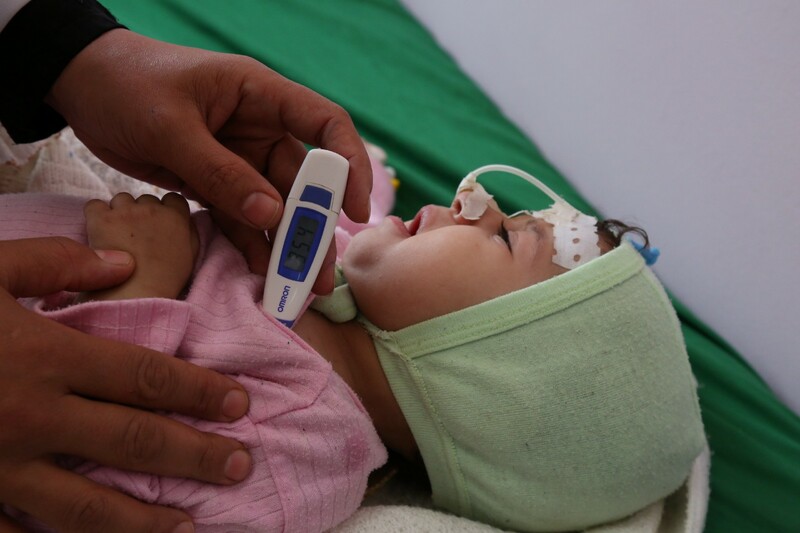 One-year-old Khalwa is one of the many thousands of children admitted to hospital. “At first it was diarrhoea. She became so light that I could carry her with one hand. Then she lost appetite. I got worried,”said her mother, Um Khawla. Khalwa had been regularly sick ever since she was four months old, but for six months, her mother had somehow found the money to take her for regular check-ups at the hospital. “Before the conflict, my husband had a job and his salary was adequate to meet our needs,” said Um Khawla. Khalwa’s mother was able to find the money to bring her to hospital when she showed signs of illness. This impoverished Middle Eastern country is now teetering on the verge of total disaster. One in three children — 2.2 million — and another one million pregnant women or new mothers are malnourished and in need of assistance. “Water, sanitation and health systems have all but collapsed. 27 million Yemenis are staring at an unforgiving humanitarian catastrophe. The biggest victims of this man-made tragedy are Yemen’s most vulnerable population — its children,” said Dr. Meritxell Relaño, UNICEF’s Representative in Yemen. Locals queue up to fill jerry cans with clean water from a UNICEF distribution point. With barely functional water treatment plants, sewage and uncollected garbage is piling up in the streets, and contaminating water supplies. Where there are safe water sources, rows of jerrycans stand in for people waiting to collect their water for the day. Children push trolleys filled with as many containers as they can manage. It is a heavy load, but one that won’t make them sick. 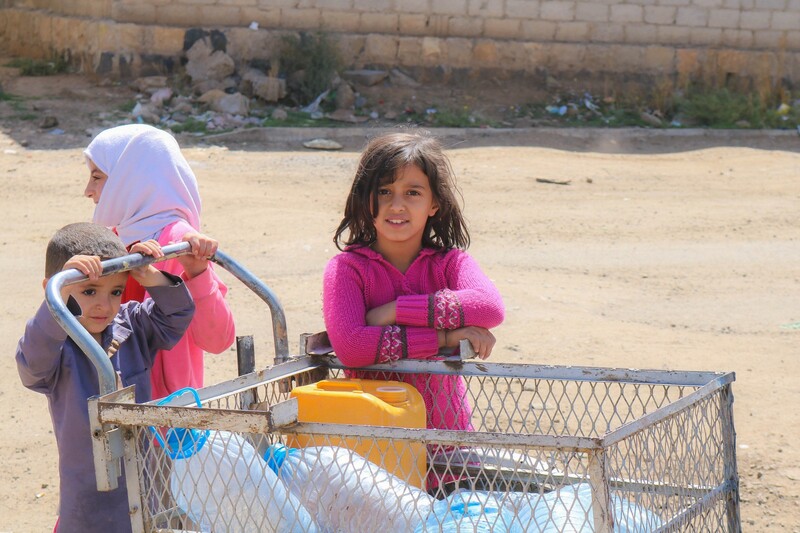 Children bring their jerry cans to fill with water in Sana’a. 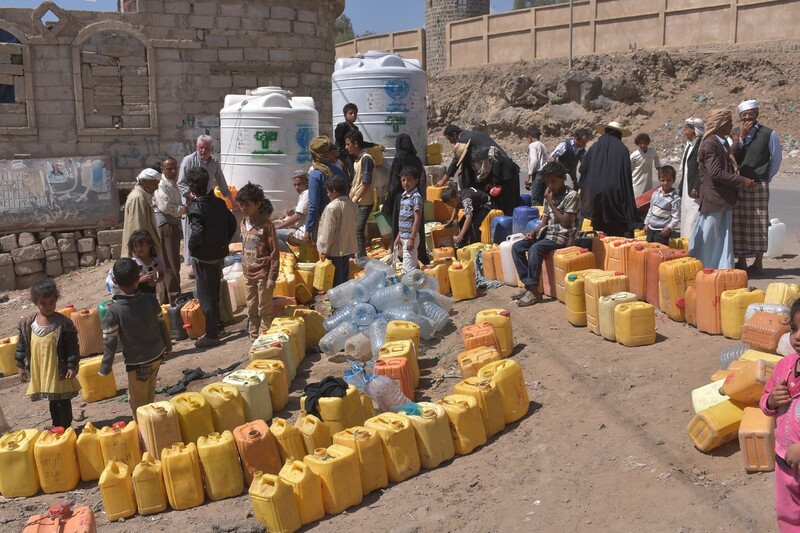 Two-thirds of Yemen’s population have no access to safe drinking water. Half of the country’s health facilities aren’t working, and what remains of the country’s weakened health system is completely overwhelmed. In response to the cholera outbreak, UNICEF has sent in three aircrafts carrying over 40 tonnes of lifesaving supplies to treat more than 50,000 patients. A doctor checks on a girl suffering from cholera. Already, resources have been provided to treat almost 350,000 severely malnourished thousand children, and another quarter of a million children, pregnant women, and breastfeeding mothers will receive basic healthcare services. But the needs of Yemen’s people continue to increase, with medicines and other vital medical equipment in short supply. 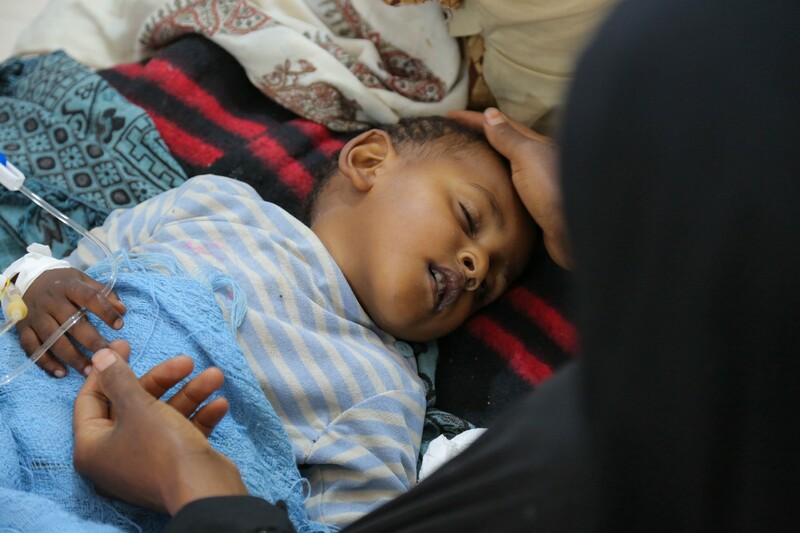 This child is receiving treatment for cholera at Sab’een Hospital in Yemen. Words by Lachlan Forsyth, UNICEF NZ.